Clean air in preschools in Silesia! Otrivin backs up the fight against smog in Żywiec. 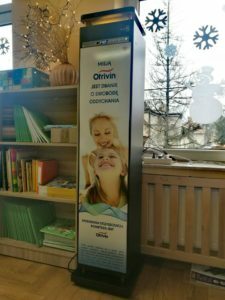 Thanks to the Otrivin brand, on 30th of January 2019, high-class devices produced by Radic8 have been installed, in chosen preschools and nurseries in Żywiec. The devices remove, not only, particulates, nitric oxide and other volatile organic compounds from the air, but also, viruses and bacteria! Even though, Żywiec is a well-known and beloved city, it still holds an infamous 4th place as the most contaminated region in the European Union, according to World’s Health Organisation’s records for the year 2018! To counteract the problem, Otrivin decided to fund the technology, as a part of Smogathon 2017 contest, where Radic8 won the Special Implementation Prize, with the new technology able to efficiently and successfully fight the smog. Radic8 is a British company, producing high-quality air purifiers, that elliminate, not only, particles that form smog, but also viruses and bacteria, up to 99,9 %! As of 30th of January 2019, the devices will be in six preschools and one nursery in Żywiec, so that the youngest could breath fresh air and benefit from it. The smog problem, well-known to the inhabitants of Cracow, affects especially children, who are more susceptible to toxic substances inhaled with air. Considering that the respiratory system develops up to the age of 8, any exposure to toxic compounds residing in the air, at an early stage of development, can cause lasting impairment of the lung tissue and affect the function of the respiratory system at older age. We also tend to forget, that smog exists, not only in the air outside, but also indoors, like in preschools or nurseries. Luckily, Otrivin, a brand owned by GSK, comes with aid! Their mission includes: taking care of our health and effortless breathing. They support projects, that deal with improvement and preservation of health, against various diseases and chest infections. It is all part of the program: “Marka Otrivin kontra smog”, which enables them in introducing new technology, like Radic8, onto Polish market. The Smog problem won’t go away by itself, but we can fight it with implementing projects, that support clean air breathing. We decided to install special purifiers, that eliminate particles and viruses in preschools. It is the children that are most vulnerable to harmful effects of the air contamination. We believe that, this way, we can improve the quality of life and health for the youngest citizens of Żywiec. - said Agne Vaivadaite, Otrivin Brand Manager with GSK Polska. As part of Otrivin’s program, in each preschool where the device was installed, there were organised special shows introducing information essential to understanding clean air and how contamination can affect our physical health, especially in a period of time, when smog is visibly present. The winning producers of Radic8 Viruskiller purifiers, developed new, more efficient and productive devices, that allow the exchange of air and cleansing it of the contamination, like particulate matter PM 2,5 and PM 10, that comes from outdoors and forms Smog. Regular usage of Radic8 purifier lowers the risk of exposure to harmful chemical compounds, for ourselves and in particular, for children.